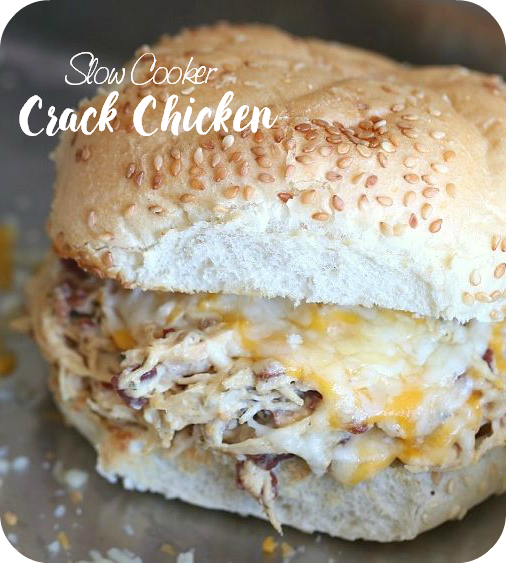 This Slow Cooker Crack Chicken is Creamy Cheesy Ranch and Bacon Shredded Chicken. It’s perfect on it’s own, on a sandwich, in a tortilla or as a dip! I know the name is a bit awkward but I promise, I didn’t come up with it. My Mom found this recipe in one of her 100 cookbooks and if you’re a chicken lover, you’ll love this and it’s super easy. I have looked up this recipe on the internet and the internet has deemed the combo of Cheese, Ranch seasoning and bacon as “crack”… Crack Bread,Crack Dip… It’s a thing. Anyhow, the ingredients will transform into a creamy, tasty, shredded chicken that you can use in TONS of ways: Sandwiches, Nachos, Enchiladas (Hello..Crack Enchiladas…how FUN! )… so scoop it onto a bowl of crunchy lettuce and you have yourself Crack Salad. Whhhaattt? Also, you can add 2 flavored blocks of cream cheese in place of 2 blocks of regular cream cheese. I have found bacon flavored cream cheese that I will try next. I haven’t done this just yet but I believe it will be a fun way to experiment with this recipe. I will start out using one flavored cream cheese and one plain cream cheese so I can be safe and not over do the taste. When I make sandwiches, I top it with a bit more cheddar and place it under the broiler for a beat. Because more cheese is more cheese and we like it like that. In a slow cooker combine chicken, cream cheese, and Ranch seasoning. Add in crumbled bacon and stir to incorporate. Add the bacon last so it stays crispy. This looks oh so good!! MMMMMM,…this recipe sounds amazing. Yum!